South Africans to head to polls on 8 May - SABC News - Breaking news, special reports, world, business, sport coverage of all South African current events. Africa's news leader. President Cyril Ramaphosa during his State of the Nation Address on Thursday. 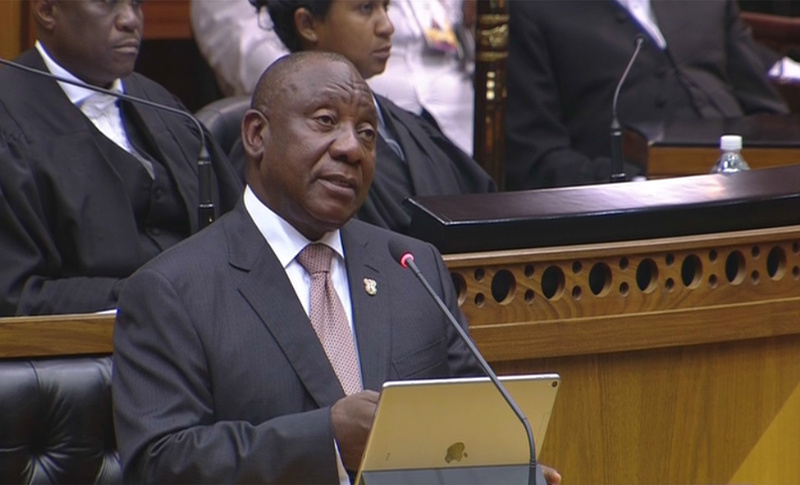 President Cyril Ramaphosa during his State of the Nation Address announced on Thursday that South Africans will vote in the general election this year on the 8th of May. Ramaphosa said he engaged with the Electoral Commission and also with the Premiers of all provinces on the matter. He urged South Africans who have not registered to vote yet, to do so before the official proclamation of the election date. “We are a people of resilience, we are a people of great determination and we are a people of great optimism. Despite the worst excesses of apartheid we did not descend into vengeance when our freedom was won. Our democracy has blossomed, it has also flourished. It has been nurtured by the goodwill of the men and women of this great nation and this great land who understood only too well at what cost our freedom was attained,” the President said. The voting age population (those who can legally vote) is estimated to be around 34-million. Previous general elections were held on 26 – 29 April 1994, 2 June 1999, 14 April 2004, 22 April 2009 and 7 May 2014. In the country’s inaugural democratic polls in April 1994, although 27 political parties participated, only 7 won seats. However, in the 1999 elections, of the 16 parties that contested nationally, only 13 won seats in the National Assembly. Five years later, 21 parties contested but 12 won representation. By 2009, 27 political parties threw in their hat to contest the national ballot; only 13 won a seat. For the 2014 general elections, 29 political parties signalled their intention to be represented in the National Assembly; only 13 however secured a seat. 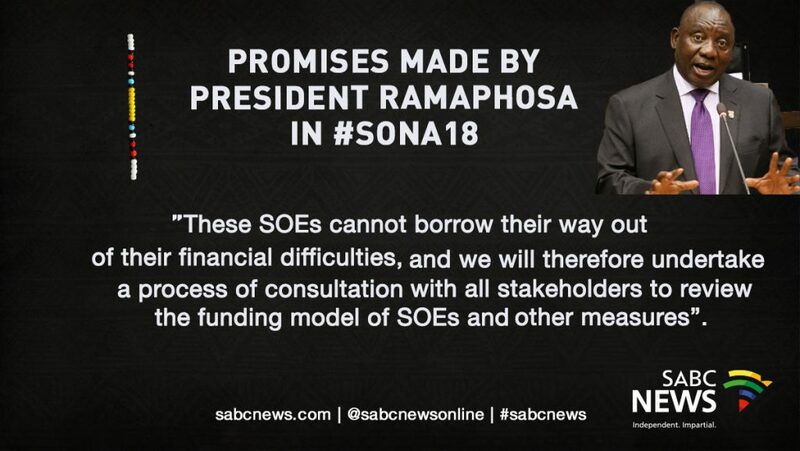 Ramaphosa says government has taken decisive measures to improve governance, strengthen leadership and restore stability at State Owned Enterprises (SOEs). The South African Broadcasting Corporation has been battling to stay afloat. The embattled national carrier, South African Airways has been on the verge of financial collapse for some time. Last year, the airline received over R15 billion in government bailouts. Eskom’s debt has ballooned from around R106 billion to more than R419 billion over the past decade. Ramaphosa says this year, government will focus on amongst others accelerating inclusive economic growth, job creation, improving the education system and skills development. He said South Africa is experiencing a sluggish economy and according to figures by Stats SA, the unemployment rate is 27.5%. Ramaphosa has also highlighted other tasks that government will be focusing on. During his address, Ramaphosa said the revelations emerging from the Commission of Inquiry into State Capture and other commissions are deeply disturbing. The commissions reveal the breadth and depth of criminal wrongdoing that challenges the foundation of our democratic state. In addition to the Zondo Commission, the President has also established the Mokgoro Enquiry to look into the fitness to hold office of suspended NPA senior advocates Nomgcobo Jiba and Lawrence Mrwebi. An Inquiry into the Affairs of the Public Investment Corporation is also under way. Ramaphosa has commended the Commissions in their quest to uncover the truth. This entry was posted on 07 Feb 2019,09:02PM at 9:02 PM and is filed under SONA, Politics, News, Homepage Featured Story Slider. You can follow any responses to this entry through the RSS 2.0 feed. Both comments and pings are currently closed.